Arguably the first attraction to open at Disneyland was the theater in Frontierland which opened July 13, 1955 for an invitation-only party. It has been called a saloon, and although it does feature "the longest little bar with the tallest glassful of pop," it's not a very authentic one. 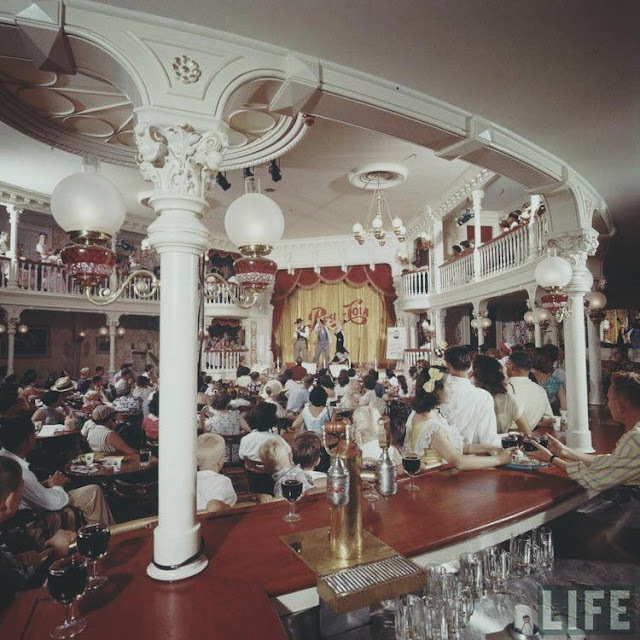 Instead of a rustic drinking and cards establishment on the frontier of civilization, this music hall is all gussied up and prettified, with gleaming white woodwork, rich red velvet curtains, and shiny brass footlights. Legend has it that Harper Goff, who had worked at nearby Warner Bros., stole the design from a set built for Calamity Jane (1953). 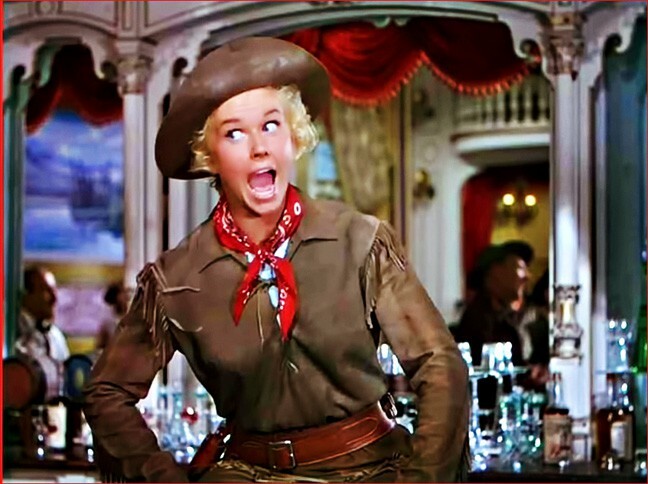 The Doris Day, Howard Keel film was released in November 1953. Anyone could have been inspired by the flat-floored music hall with a mezzanine overlooking the stage. It is doubtful that Goff stole the plans for the Golden Garter saloon from Warner Bros. In the first place, Harper Goff had worked for Walt Disney Productions since October 12, 1951 and for Walt Disney personally before that. His Warner Bros. days were behind him. John Beckman, the designer of Grauman's Chinese Theater (1927) was the credited art director on Calamity Jane. On Disneyland, Harper was assigned to art direct Adventureland. 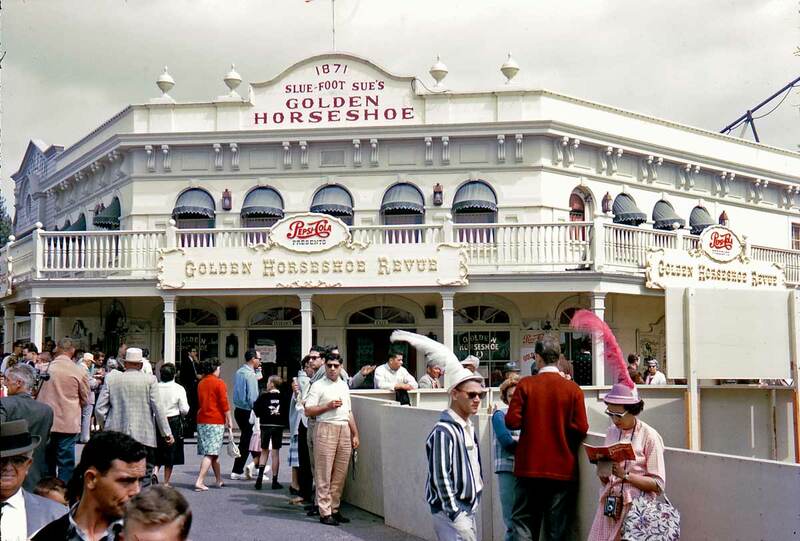 George Patrick was responsible for Frontierland, including the Golden Horseshoe. Patrick had worked with Panoramic Productions and Twentieth Century-Fox, not Warner's. Historian Todd James Pierce first noticed that the set was used again by Warner Bros. for the Phantom of the Rue Morgue (1954). Warner Bros. would have zealously protected their intellectual property, especially a set design that could be repurposed for future projects. The saloon was going to be Paul Bunyan's Longest Little Bar in the World, but Walt wasn't happy (or the Legal Dept. had a problem with it). It became Pecos Bill's in May 1955. "The Saga of Pecos Bill" was written by Edward O'Reilly for The Century magazine in 1923. Cowboy Bill meets Slue Foot Sue, a "heck of a cowgirl," who nearly makes him forget his horse, Widowmaker. Sadly, on their wedding day, Sue is bounced into space. In O'Reilly's telling, Sue returns a changed woman and the couple divorce. In 1948, Disney adapted the tall tale for a segment of the anthology Melody Time. The Disney version changed the ending. Sue never returns from space and Bill is left howling at the moon. Therefore, it seems a bit curious that Sue would be proprietress of a saloon in Frontierland--where's Pecos Bill?--but the name was changed to Slue Foot Sue's Golden Horseshoe at the end of June. There was no sign outside for several years. 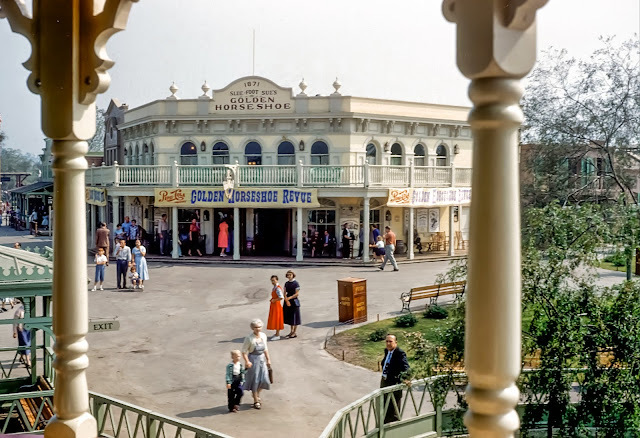 Instead, the Golden Horseshoe Revue was advertised on three banners tied to the balcony railing on the building's three-sided facade. The pediment proclaims "1871," which suggests Kansas City, perhaps, because anything further west would have been much less civilized than the Golden Horseshoe. The "Flora Dora girls" in the show are more associated with San Francisco's turn-of-the-century Barbary Coast. By 1962, the building was all white with fancy, permanent signs. Frontierland George Patrick Harper Goff Todd James Pierce Warner Bros.
Labels: Frontierland George Patrick Harper Goff Todd James Pierce Warner Bros.